For seven years Jhony Salvador has been banging on victory’s door in the Dig the Beach Volleyball Series only to come up short. Undaunted, the 25-year-old Deerfield Beach resident and his playing partner Martin Caban (Tampa) joined the Men’s Open winners circle with a 21-11, 21-23, 15-11 upset victory over Dave Palm (Coral Springs) and JM (John Michael) Plummer (Fort Meyers). 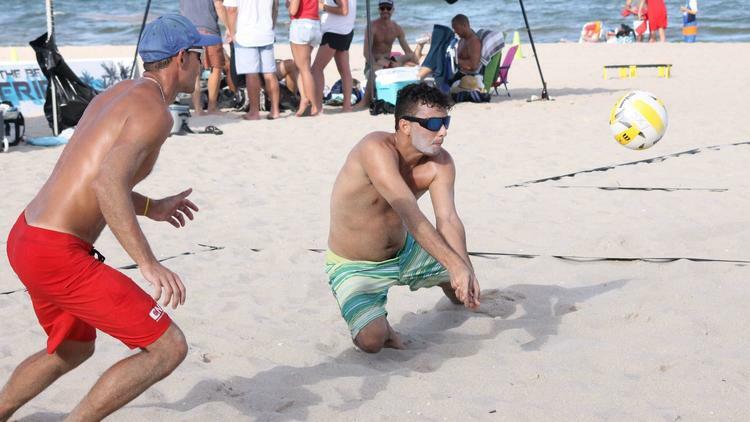 The Dig the Beach tournament took place on Pompano Beach. In the Women’s Open, Sarah Schmerhorn and partner Kim Hildreth shared the first-place award with Aurora Davis and Lexy Denaburg. There were 23 women’s and 17 men’s open teams. The women’s teams shared a cash purse of $2,300, while the men’s purse was $1,700. It was a sweltering day that witnessed many athletes succumbing to leg cramps as the tournament turned out to be a survival test of the fittest. In the Junior Championships, the Dig the Beach season point champions were: 12U Girls Samantha Crosby, Riley Baer and Zara Stewart; 14U Brooke and Ashley Pater; and 16U Anna Mallory.